At the Metropolitan Golf Club you enjoy your game in the most centrally situated green belt of Cape Town. Adjacent to the V&A Waterfront (5 minute walk) with magnificent views of Table Mountain and Signal Hill. The Metropolitan course is officially a 9 hole course but a variety of greens and tee's result in a different challenge on the second round. 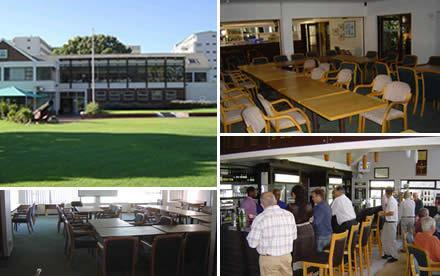 A solid structure which houses the proshop,offices and function rooms,the clubhouse overlooks the beautiful table mountain and signal hill area ,and is a hive of social activity. On the 2nd floor and shared with the meeting room,all your conference needs are accomodated whilst overlooking the new 18th hole. Enjoy a drink and a chat with friends after your round ,in the tastefully renovated and airconditioned bar and lounge area. On the 2nd floor opposite the meeting room overlooking the new lush finishing holes with table mountain as the backdrop.